DOG TREATS & PUPPY CHOW JUST 4 YOU! Thank you for the wonderful cookbook. Can't wait to treat the puppers. 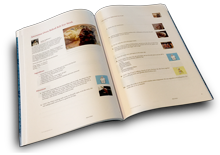 Nancy, thanks for adding my Beef and Rice Dog Food recipe to your cookbook! I hope you have a very blessed Christmas, and a joyful New Year! Thanks, Nancy, for including my dog food recipes! ONLY 3 days left............. HO! HO! HO! A BLESSED HOLIDAY TO ALL !! !